L. Jagi Lamplighter‘s Rachel Griffin series is a fantastic modern fantasy series for young adult readers. I’ve already reviewed the first two entries here and here. 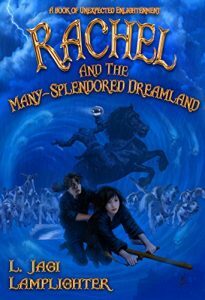 The newest entry, Rachel and the Many-Splendored Dreamland, is available today. As with the second book, I was fortunate enough to receive a free review copy – only this time I was even luckier because I got it in advance! Like the first two entries, this book is fantastic for the Harry Potter fans in the audience. Mrs. Lamplighter does a wonderful job of capturing the feel of Ms. Rowling’s world without making it feel like it’s just a copy. Roanoke School resembles Hogwarts in feel, but it’s definitely a unique place of its own, and the characters are fresh and interesting, not just retreads of Harry and Friends. Rachel Griffin herself continues to be an excellent and interesting character. Somehow I have now read three books about this thirteen year old girl without once wanting to strangle her. I suppose it is a fantasy book, after all! I do have two complaints about this book, however. First, there is a pretty fair amount of talking rather than doing. It’s engaging talking, and it’s fun. It never gets dull. But at the end of the day it feels like not much actually happens… until all of a sudden there’s a giant confrontation at the end. The first book suffered a bit from “talking rather than doing” syndrome as well, but not to this degree. And that feeds into the second problem, which is closely related. This book is a “middle” book, and it kind of felt like it. It wasn’t anywhere near enough to destroy the book – I still found myself so enthralled that I finished it very quickly. But it is enough that I noticed it. This book completely fixed both of those issues. Indeed, it went much the opposite direction. The book opens with a bang and it hardly stops to catch its breath. This is definitely the action-packed entry in the series. It’s a wild ride that’s over all too soon and leaves you wanting more. There is one issue that I will log not so much as a complaint as a note. This book is about a thirteen year old girl, and its target audience is the Young Adult market – specifically, young girls. Parts of the book delve into Rachel’s feelings about relationships in a way that is probably pure crack to that target audience… but it’s not particularly appealing those of us, say, in the “mid 30s and male” demographic. It’s not a bad thing. Teenage girls will eat it up. Me? Not so much. Still, that’s what this book is aimed at, and it fulfilled its goal well. Even with that, this was easily the best entry in the series to date. Highly recommended for Young Adults, especially girls, who like fantasy books. Highly recommended as well for adults who like fantasy and can enjoy the occasional Young Adult novel. Five out of five stars. August was a great month for me, but it was also pretty rough. So after DragonCon last week, I took a bit of time to just relax. Outside of my day job, which I can’t really shirk, I didn’t do much “real work.” That will catch up with me later. I still have a ton to do. But I did get to read a few good books. 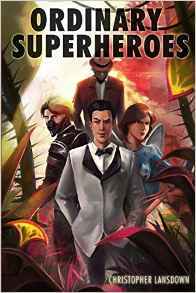 Last week I left a review of Christopher Lansdown‘s Ordinary Superheroes. 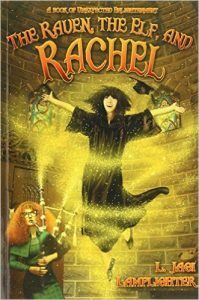 Today it’s The Raven, The Elf, and Rachel by L. Jagi Lamplighter (aka the Mrs. John C. Wright). Full disclosure: Mrs. Lamplighter sent me a free electronic copy of this book for review purposes. I had been prepared to buy it anyway, because I absolutely loved the first book in the series. Thankfully she caught me in time and saved me some money! Like its predecessor, this book is a very fast and easy read. The language, as befits a young adult book, flows off the page easily and quickly – but it will still give younger readers enough new words to expand their vocabularies. It’s also immediately engaging, and the characters retain your attention throughout. In the first tale, Mrs. Lamplighter introduced us to the rarest of mythical fantasy creatures. Rachel is a believable thirteen year-old girl that doesn’t make you want to strangle her. That continues in this tale, and it’s the strongest part of the series. Rachel herself is immediately recognizable as a true-to-life young girl, and she’s extremely likable. All of her friends are fleshed out even further, and each of them continues to be an absolute joy to read about. The characters are easily the best part of this tale. In a coincidental bout of timing, Morgon and I also watched the entire first season of Stranger Things last week. These two series shared something that I greatly enjoyed: both featured smart, interesting, and believable children doing heroic things – but heroic things that weren’t actually above their abilities to do as children. In our modern society of helicopter parenting and sheltered youth, it’s refreshing to see children let out of their shackles for a while to grow and thrive. Even so, the book was a lot of fun, with a little depth to it as well. I’d highly recommend it for any youth into fantasy stories, and most especially to young girls and Harry Potter fans. Adults will enjoy it, too, however. I don’t read a ton of young adult fiction these days, but this was a welcome bit of light fare. All told, this is a four out of five star book and I greatly look forward to finishing the series. DragonCon 2016 was great. I got to spend the weekend with my good friend Dan Baker of Oxide Games. I met a few folks who were well worth meeting, including meeting Declan Finn in person. We enjoyed a few fantastic panels. I photographed some lovely cosplayers. And I finally had some time to catch up on a bit of reading. In particular, I finally finished Christopher Lansdown‘s Ordinary Superheroes. I must apologize to Mr. Lansdown. He sent me a free review copy of this book quite some time ago. The delay in this review is through no fault of the book. It is merely because August was one of the busier months of my entire life. Merging two already-functioning businesses together is a lot of work. Quite to the contrary, this is a pretty fun book. As the title and the cover might suggest, it’s a young adult book and should be approached as such. With that said, however, there’s a lot here for adults and parents to like. For one thing, this is a pretty clean book, which is not at all guaranteed in YA these days! As a parent, I’d have no objection to even pretty young children reading this. For another, there’s genuine humor in the superhero banter, much of which will actually leave young readers thinking. The characters are fun, and Mr. Lansdown fleshes them out well. But the best part of this book is its villain: The Bureaucrat. Seriously, how can you not love that concept? The name alone makes me want to punch him in the face – and it’s rewarding when Mr. Macho, one of the book’s trio of protagonists, finally gets the chance to do so. What’s his beef? He hates living. Not his own life, but all living. Basically, he’s like any other small-b bureaucrat. He just has a lot of superpowers to go with that. I’ll refrain from spoilers here, but the ending isn’t quite what I expected. That’s a good thing. And I liked how the characters found their way into it smartly, thinking their way through. My biggest complaint about the book is that it bogs down a bit in the middle. If you find this happening, like I did, then note that it’s worth pushing through to the finish. You won’t stay stuck in that bit for long. The short, quick nature of the book helps alleviate this quite a bit. I give this book four out of five stars. Most adults will enjoy it. But if you’ve got a young teen who likes superheroes, this one is for them.